The Horizon Tech Falcon Sub Ohm Tank is the fusion of many top notch features culminating in a well thought out tank system. This tank utilizes a triple bottom airflow system and a new technology using coils with flax and wood pulp materials that is very innovative. Using these materials allows for enhanced flavor and faster saturation. Each Falcon Sub-Ohm Tank comes with 2 coils. The 0.2ohm F1 Falcon Coil has a core in the center made from 70% cotton and 30% wood pulp. The other, the 0.15ohm M1 Mesh Falcon Coil uses a composition and similar materials as with the F1, with the added integration of mesh in the design. It has a large 5ml tank capacity and can be filled at the top. This allows easy maintenance and filling. Get access by simply unscrewing the top of the tank. 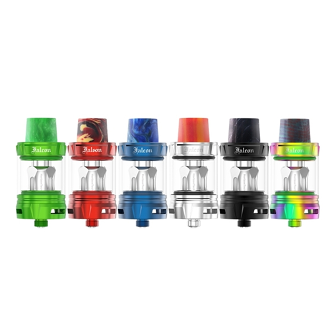 The Falcon Sub-Ohm Tank also has a wide bore resin drip tip and comes in several great colors to cater to your aesthetic needs.